Patients who can’t swallow because of a medical problem still need nutrition and fluids. Getting these other than by mouth is called artificial hydration and nutrition. Artificial hydration and nutrition works for many types of patients. Doctors use it for patients who have temporary medical problems and have lost fluids through vomiting, sweating, or diarrhea. They also may provide artificial hydration and nutrition when someone has an advanced, life-threatening illness and is dying. Why do our bodies need fluid and nutrition? By going to the bathroom (about 45 ounces a day). By sweating and breathing (at least 21 ounces a day). Our bodies get nutrients from the food we eat. These nutrients give us energy and help our bodies work properly. We have to eat food and drink fluids every day to get the amount of water and nutrients our bodies need. What are the different ways to provide artificial hydration and nutrition? There are 2 ways to replace fluids in someone who needs them. The first way is to put the fluid right into a vein. This is called intravenous (IV) fluid replacement. The other way is to put the fluid under the skin. This is called hypodermoclysis, or subcutaneous, fluid replacement. Another method of artificial nutrition and hydration is through a plastic tube called a nasogastric tube (also called an NG tube). This tube is put through the nose, down the throat, and into the stomach. It can only be left in for a short time, usually 1 to 4 weeks. If a tube has to be in for longer than 4 weeks, a different kind of feeding tube may be used. It’s placed into the wall of the stomach (also called a PEG tube or g-tube). With IV fluid replacement and feeding tubes, doctors and nurses need to watch the person very closely in a hospital. But a family member or another caregiver can do hypodermoclysis at home. A doctor or nurse can show them how to do it. A bag of fluid is connected to a long needle by a plastic tube. The needle is put under the skin and taped in place, usually on the chest, abdomen, or thighs. The fluid drips from the bag, through the tube and needle, and into the skin. The skin then absorbs the fluid into the body. A small window, or “drip chamber,” in the tube shows how fast the fluid is dripping. A roller clamp controls the speed of the drip. Your doctor will decide how fast the fluid should drip. Your doctor will show you how to control the drip and tell you when to check it at home. You can ask your doctor for help if you have questions or problems. A nurse or doctor should replace the needle every 4 to 7 days so the flesh around the needle does not become infected. What are the common problems with hypodermoclysis and what should I do? The speed of the drip changes or the drip stops. Your doctor will show you how to control the flow rate by rolling the roller clamp. The site where the needle is inserted will swell. If you gently rub the skin there, the fluid will soak in better. Your doctor will show you how. Call your doctor for help if the swelling continues or does not get better. The site where the needle is inserted becomes painful. Check the skin for redness. Tell your doctor if the skin is red. It may be time to find a different place to insert the needle. Blood collects in the tube. This means the needle has gone into a vein. Call your doctor if this happens. The person has trouble breathing or is feeling much worse. If this is the case, call your doctor. A person who has a temporary illness and can’t swallow needs nutrients and water. Artificial hydration and nutrition can help prevent dehydration and help the patient recover from his or her illness. 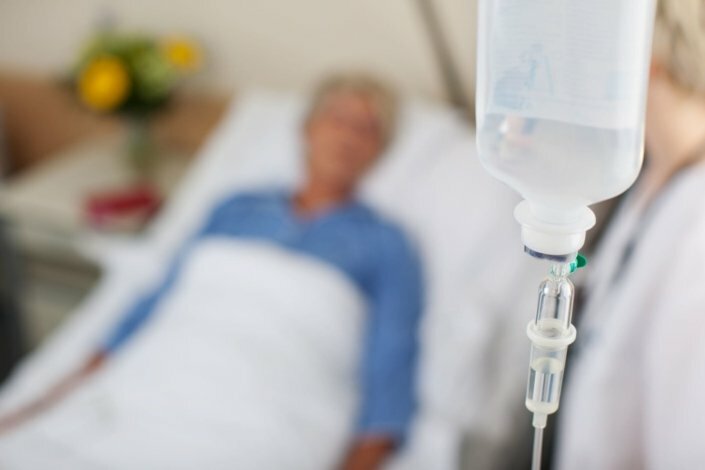 For a patient who has an advanced life-threatening illness and who is dying, artificial hydration and nutrition may not provide many benefits. Artificial hydration and nutrition in these patients may make the patient live a little longer, but not always. IV fluid replacement and hypodermoclysis can cause infection at the site of the IV or hypodermoclysis needle. Blood clots can form in the vein and cause pain and swelling. Fluid overload and electrolyte imbalances are also possible side effects. There is always a risk when someone is fed through a tube. Liquid might enter the lungs. This can cause coughing and pneumonia. Feeding tubes are often uncomfortable for the conscious patient. They can become plugged up, causing pain, nausea, and vomiting. Feeding tubes may also cause infections. Sometimes, patients may need to be physically restrained or sedated to keep them from pulling out the feeding tube. What happens if artificial hydration or nutrition are not given? People who don’t receive any food or fluids will eventually fall into a deep sleep (coma) and usually die in 1 to 3 weeks. How do we decide whether to use artificial hydration and nutrition? Talk with your doctor about the risks and benefits of artificial hydration and nutrition. Each situation is different. Your doctor can help you make the decision that is right for the patient and family. Is artificial nutrition and hydration part of life support? How long can a patient be on artificial nutrition and hydration? Should I make artificial nutrition and hydration part of my advance directive? Is it considered suicide to refuse artificial nutrition and hydration? What does the law say about artificial nutrition and hydration?